These days Thamizhini's verbal power is growing in high speed and as well as she is becoming adamant too! She answers what we ask, only if she is interested. Else how much ever you shout, there is no use of it. As she is able to tell her name, these days "Pamiyini" is the word she uses most. I'm a naughty girl! Aavene Adamant girl! * Adamant and Naughty (I was laughing literally whenever I see "pants wearing video"). * She can tell her name, daddy's name and even Amma's name. Yeah, We never knew that she knows my name. 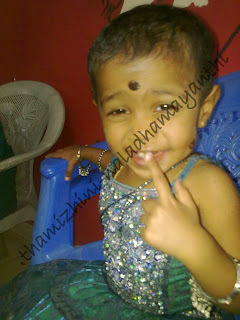 She never called with name, but once asked, she thought for few seconds and tells "Bammindhi" and Bammindhi amma.